Today is the 40th anniversary of the death of Roberto Clemente. 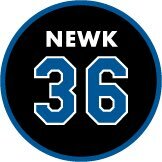 He was killed in a plane crash in the midst of transporting aid packages to those affected by a deadly earthquake in Managua, Nicaragua. His body was never recovered. Roberto also started out his professional Baseball career with the Brooklyn Dodgers. Mike Petriello at Mike Scioscia's Tragic Illness reminds us that the Dodgers offseason is far from over. 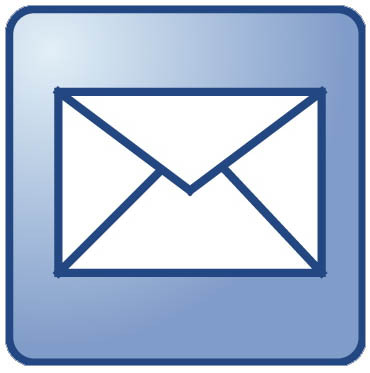 Eric Stephen at True Blue LA analyzes Bill James 2013 projections for Dodger pitchers. 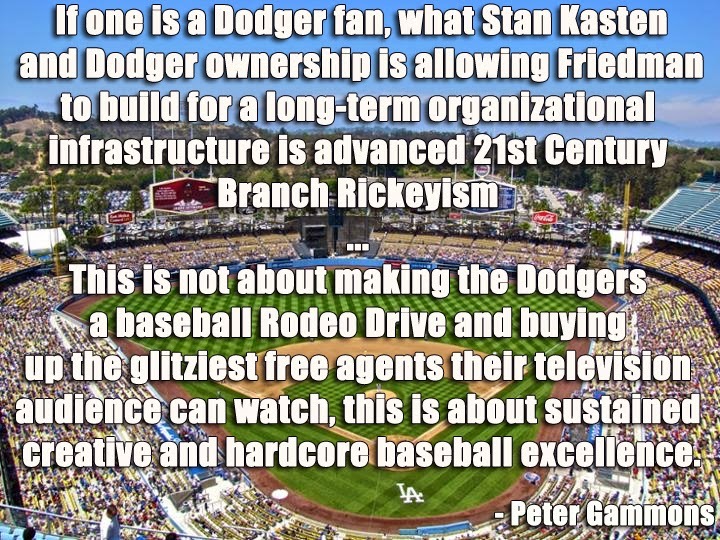 Ron Cervenka at Think Blue LA writes of his autograph obsession and Baseball's Greatest moment. Harold Uhlman at Think Blue LA remembers the great George "Shotgun" Shuba. 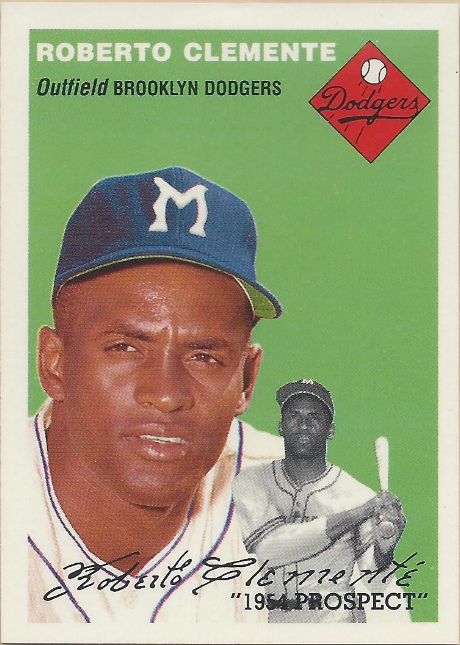 “Shotgun” got his nickname for the way he sprayed line drives while he was in the Dodgers’ farm system, but his smooth left-handed swing wasn’t a fluke, it was the result of a tenacious practice regimen when he was a teenager. Bill Baer at ESPN compares Cole Hamels versus Zach Grienke. Is Hamels really as good -- and Greinke really as bad -- as ERA indicates? It doesn't appear to be the case in a vacuum. If you put both pitchers in the same league facing the same hitters with the same defense behind them, they would likely put up remarkably similar numbers. Now with the Dodgers, though, Greinke will have a defense that is sufficiently average according to ultimate zone rating, and he will benefit from the pitcher-friendly confines of Dodger Stadium. Perhaps 2013 is the year Greinke returns to his Cy Young-caliber ways. 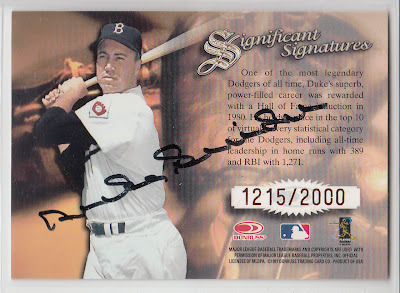 Featured here is a 1997 Donruss Significant Signatures autographed card of Duke Snider. 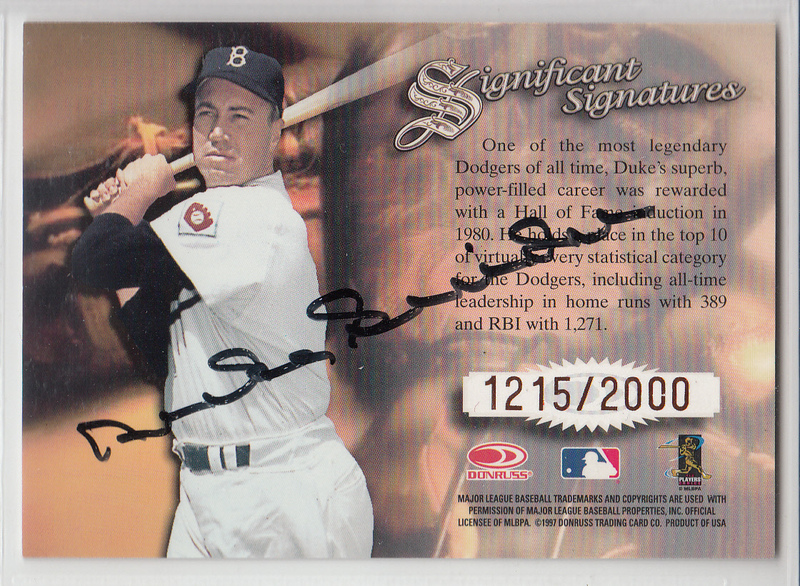 As you can see above, Duke signed 2,000 cards for this set. Strangely, he did something I don't think I've ever seen anyone else do. He signed the back of the card instead of the front. Every single one of the cards is like this. 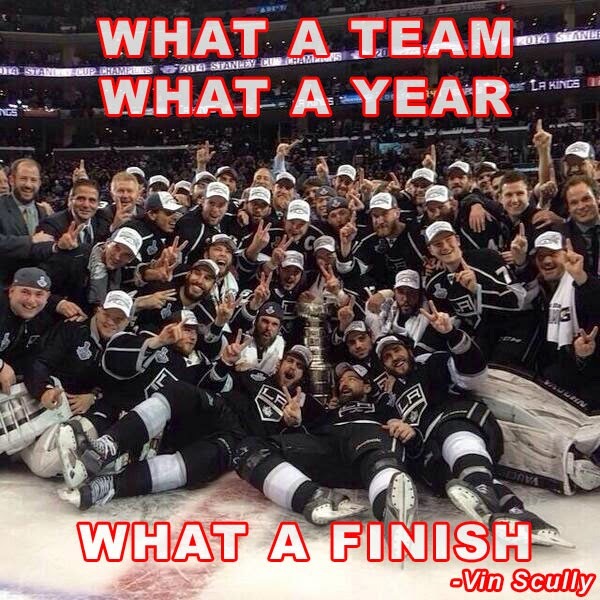 Funny, eh? Due to this and a high print run, you should be able to acquire this card for $10, or so. 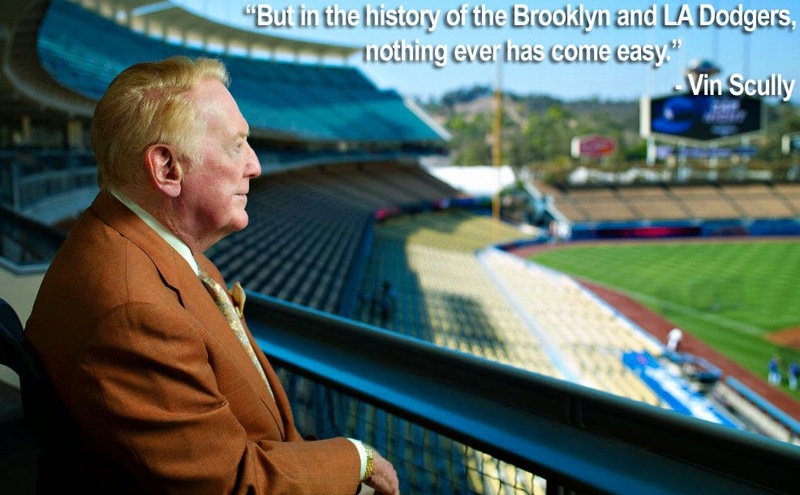 It's a great deal for a Brooklyn Dodgers Hall of Fame legend. 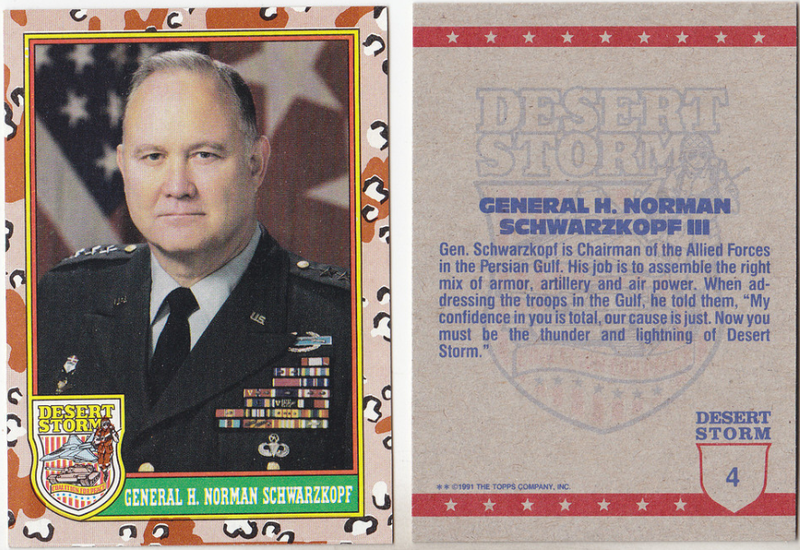 Gen. Norman Schwarzkopf rose to prominence as I was just entering my first year of college. He was bold, brash and confident. 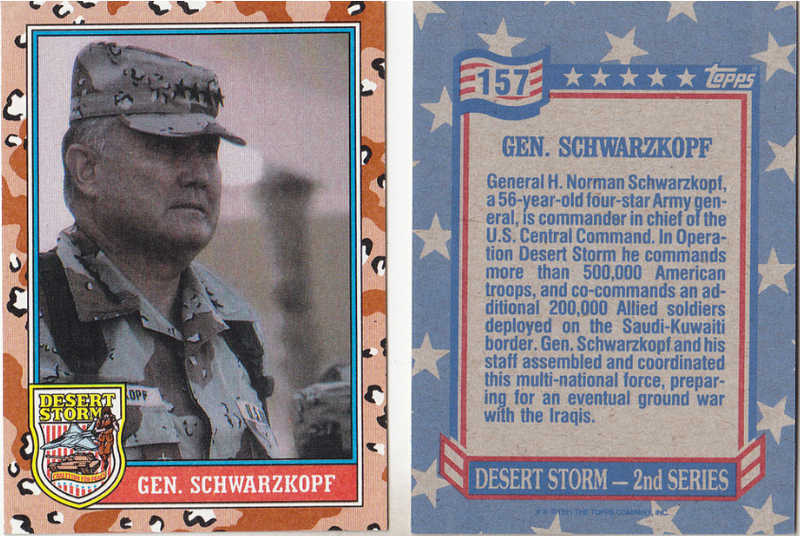 He laid out the perfect plan in the Persian Gulf War, and proved to be the best man for the job. 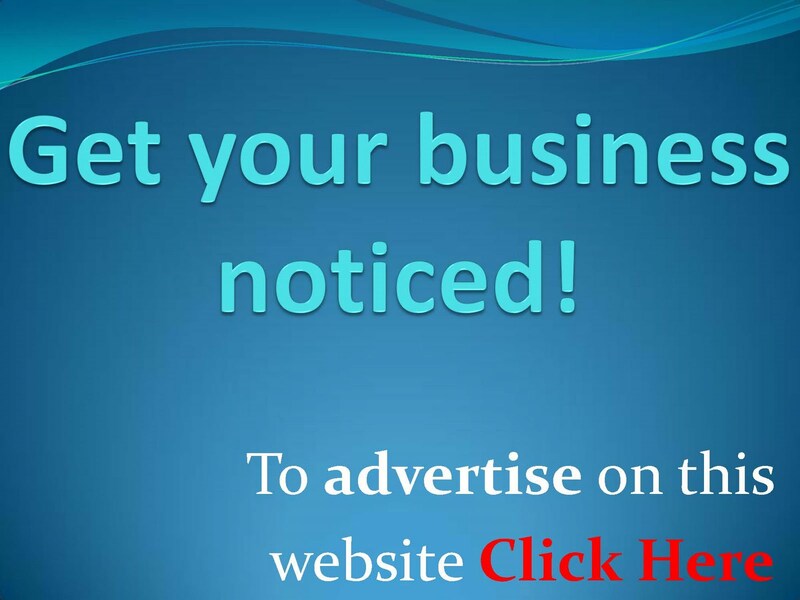 Instead of cashing in after the war for fame and fortune, he mostly retired into private life. 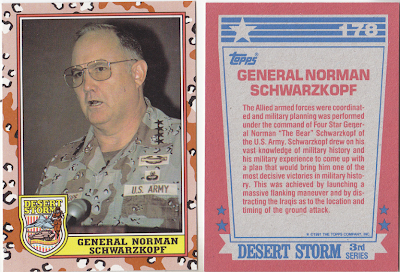 Gen. Norman Schwarzkopf passed away this past Thursday, and I wanted to take a moment to thank him for his service and to share a couple of trading cards with him on it. CNN has a great writeup on his life, here. The above card from the 1991 Topps Desert War Series 1 trading card set, below from Series 2, and Series 3. 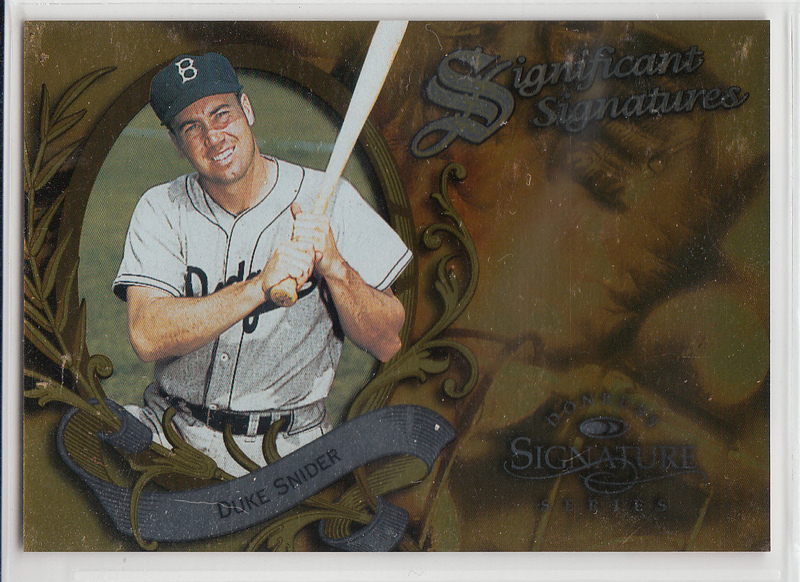 The card below is from the 2009 Topps Heritage set, and uses the vintage 1960 Topps design. Make note of the description on the reverse. 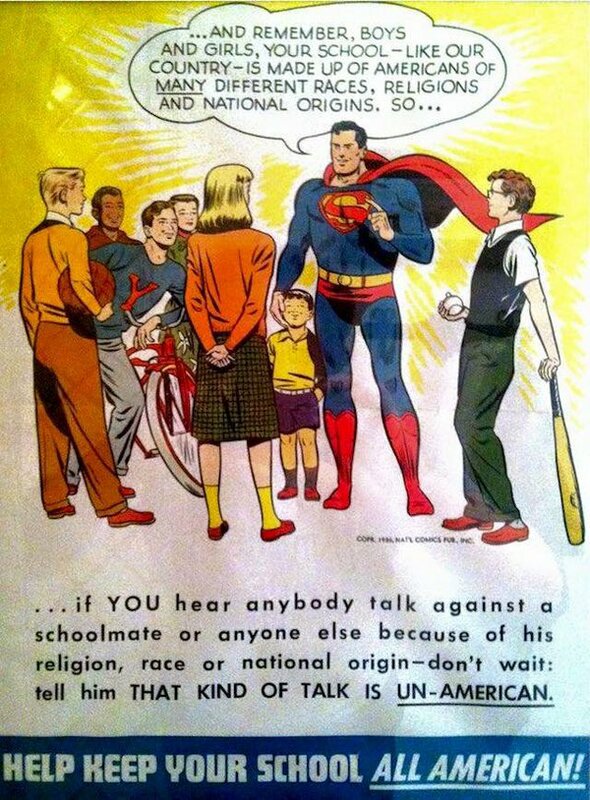 It has a glaring error. 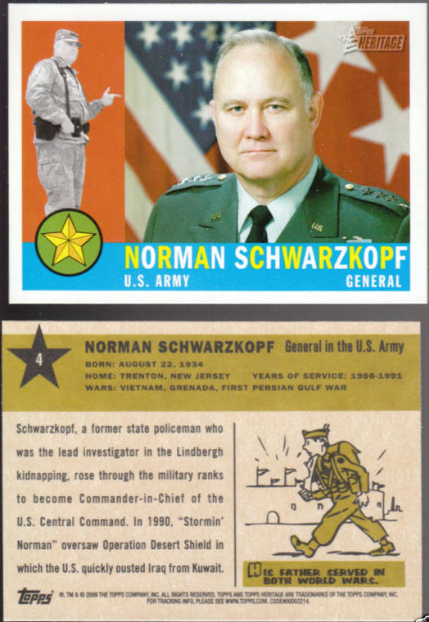 It was not this Gen. Norman Schwarzkopf that was a lead investigator in the Lindbergh kidnapping, but his father. 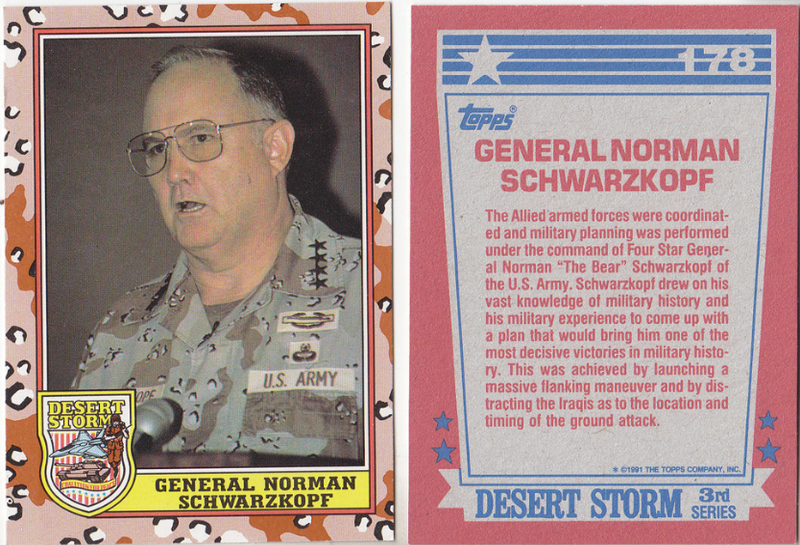 In fact, there were two generations of American Army Generals in this family.